Six months after India’s first solar cooperative was formed, its farmer members received their first initial payment of Rs 36,005 for selling 5,097 units of power to the local power distributor, Madhya Gujarat Vij Company Limited (MGVCL). At a function organised by the International Water Management Institute (IWMI)—a Colombo-based organisation which supported the project­— on August 29, six farmers of Dhundi village in Gujarat’s Kheda district were given the payment for generating power for 80 days. They started supplying power from May 10. The cooperative—called the Dhundi Saur Urja Utpadak Sahakari Mandali—was also given a bonus for 'water conservation' (Rs 1.25 per unit) and 'green energy' (Rs 1.25 per unit) by IWMI-Tata Water Policy Program. The farmers installed 56.4 kWp of solar capacity, which is used for irrigation and the surplus is sold to MGVCL at the rate of Rs 4.63/unit. The pilot project was supported by the Consultative Group for International Agricultural Research Program on Climate Change, Agriculture and Food Security and IWMI, which funded 80 per cent of the project. The project was initiated to address the huge sum government bears in subsidy for providing electricity to millions of grid-connected tube wells. Another objective was to supplement the daily income of farmers. The cooperative members are said to be inspired from a farmer in Thamna village of Anand district, who installed a solar powered irrigation pump to save the Rs 500 he spent on diesel everyday for irrigation. Selling power to the grid enabled him to earn Rs 7,500 per month. 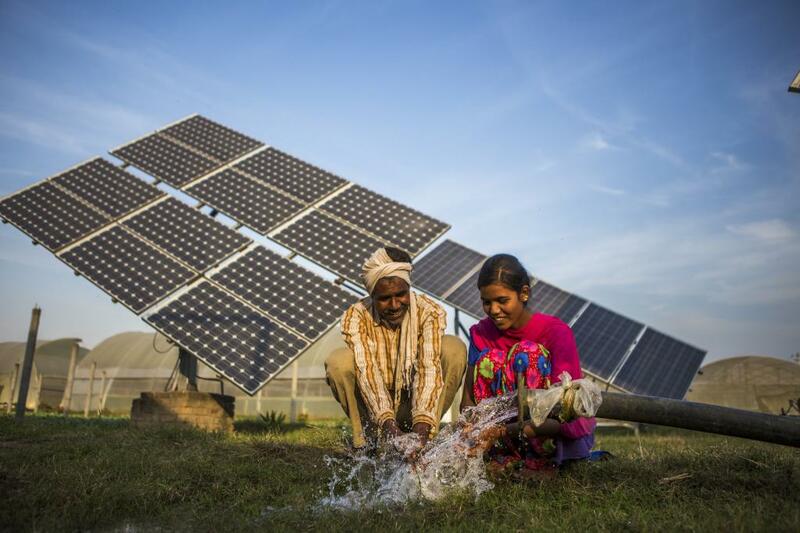 For IWMI, solarising agriculture is also a way to make irrigation climate-smart, because the use of electricity and diesel in groundwater irrigation produces about five per cent of India’s total carbon emissions. However, due to the low rate of solar power per unit, each farmer earns approximately Rs 1,000 per month. Some have started using the excess power to extract and sell groundwater to nearby villages, with each member earning 2.5 times more than the power sold to the discom. "The power purchase agreement inked by MGVCL is the lowest possible price given to any solar generator in the country. We had sought a minimum rate of Rs 7-8 per unit,” Tushaar Shah, former director of the Institute of Rural Management, Anand and a water management expert who was involved in the solar cooperative, told the media. Both Parvin Parmar, secretary and member of the cooperative, and Shah say that the government should increase the rate. Although the rate was fixed under the 25-year long Purchase Power Agreement (PPU) signed between the cooperative and the government discom, it can be negotiated. IWMI also plans to expand the project in the future. “We want to take this project to farmers who have grid connectivity and also try to sell the solar power to private players,” says Neha Durga, a consultant with the IWMI. There are Wind Farm Co-operatives in Denmark,Germany,Australia etc. In India most of the wind farms are owned by Industrial and Business Houses. Wind Farm Co-operatives can be started in India. Money invested in WIND FUND can be exempted from Income Tax under Section 80 C. This way there will be mass participation of people in wind farms.